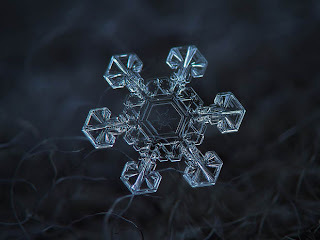 Russian photographer, Alexey Kljatov shoots stunningly beautiful macro photos of snowflakes on the open balcony of his apartment with a custom compact camera kit. According to him, he does not have any professional equipment. 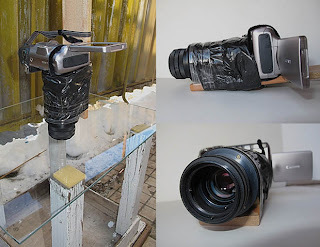 Kljatov uses a Canon PowerShot A650 equipped with a 12.1 MP sensor and some home made macro gear that he cobbled together. Kljatov said he works mostly on a glass surface with an LED flashlight illuminating the snowflake from the other side of the glass. For other shots, he uses natural light and dark woolen fabric as a backdrop in addition to the flashlight. When he was just starting out, Kljatov would employ the standard macro mode on the A650, using a plastic bottle tube to stabilize his camera while it’s pointed straight down onto the snowflake at the minimum focusing distance. He would press the shutter with one hand (with a delay so he could shoot hands free) while using the other to point the flashlight at the snowflake. Above is a photo of another one of his simple, no frills setup. He built a “super-macro adapter” using a Helios 44M-5 lebs from an old USSR Zenit SLR camera. Visit the Flickr postings and see more of his works.